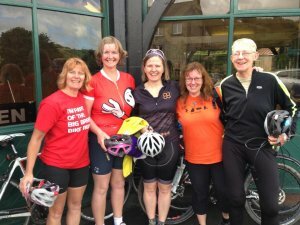 Breeze Champion, Christine Dicken explains more about her love of helping women in Derbyshire get cycling. 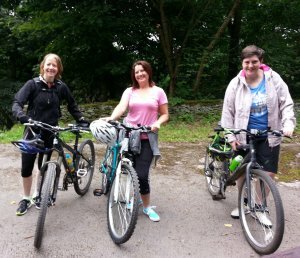 British Cycling's Breeze campaign is the biggest programme ever to get more women into riding bikes for fun. I did a family Sky Ride and it was then through that I heard about Breeze. I was looking for rides in the local area but couldn't find anything suitable. I wanted to cycle with other women. I didn't want to go out on my own and I can't keep up with the guys. And I like to eat cake! Courses are run throughout the year but I was away for the local course so I did mine in Nottingham. Christine wanted to cycle with other women. It's definitely catapulted my own cycling. I'm doing more and I'm more confident as well. I just like meeting the other ladies. I've met lots of lovely people – including quite a few older ladies. It doesn't matter what their cycling ability is. For example my Pilates teacher mentioned my rides to an older lady who came along and she brought a friend and I geared my rides round them. I enjoy doing 5 or 6 miles along the trail with them. Hilly rides offer stunning views! My niche now is going to be hillier rides which I'm going to do on a monthly basis. 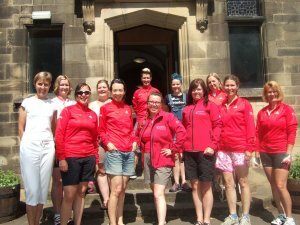 I know there are other ladies' cycling groups in the Peak but they tend to go faster. My aim is that we can still do the hills and cover the distance, but do it at a bit slower pace. 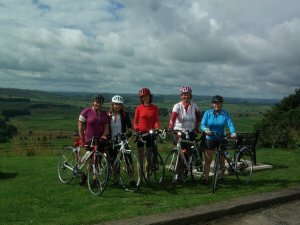 For example, during one ride, we started at Curbar and went along to the Plough at Hathersage and then rode up to Abney. The climb up to Abney is a nice hill - if you can have a nice hill! You just pick a gear and go. It's not too hard going if you take your time and there are stunning views. We then headed to Eyam for coffee before cycling over to Foolow and Wardlow and down to Monsal Head and back via Longstone and Hassop and back down towards Baslow and along the main road. Riding in a group can help overcome anxieties. Round here a lot of people are worried about the hills and whether they will actually manage them. Often they are too scared to try. And a lot of people are also nervous about cycling on the road because of the traffic. Another factor is worrying about not looking the part. That's something I feel too. I did the Rapha training ride and felt intimidated that I wasn't in the right kit, that I was too fat and not fit enough. It's hard. Having a mechanical is another factor. You do worry about getting a puncture and when I'm out riding on my own, it does affect how I choose my routes, so that worry is there for me too. But it's less of a worry when you've got someone else with you. I've been on a basic Breeze maintenance course and I tend to find that when there are a few of you, you can always muddle through. The other thing is that ladies like having company. It's nice going for a coffee and enjoying a chat. On the longer rides people have really enjoyed the route and get to enjoy a nice café stop as well. They also enjoy someone else planning the route and not having to worry about where to go or having to navigate. Some of my older ladies have told me that they've been really grateful that they aren't put under pressure. They can actually get back on a bike and achieve something. And I find that having the company of other riders also makes you push yourself a little bit more than you would if you were out on your own. To find out more about Breeze Derbyshire like their facebook page and you can also click here to find out more about Breeze and routes in your area.